Woke up an hour and a half ago from a deep, deep sleep. The windows of our wood-panelled room face east, and there was bright sunshine streaming in. As the people at the KMVN brought us tea, I looked out of the window and there was the sun, a ball of fire rising over the misty lower ranges towards Pithoragarh. From this height it almost seemed that the sun was shining below me! Priyo was up as well, and peering north through a corner of our garden-facing window he exclaimed that he could see a couple of indistinct peaks. Right! We quickly rushed out to the terrace, shivering slightly in the early morning nip. Wish I could describe the sight. 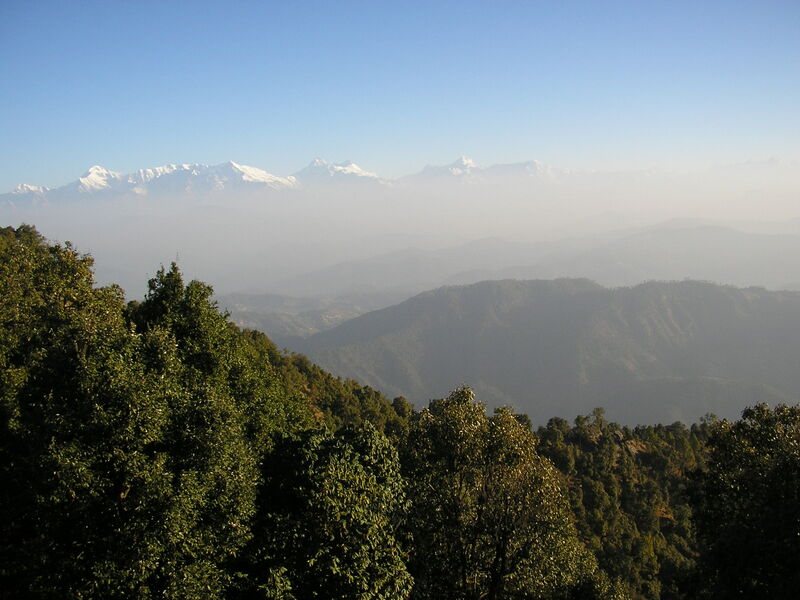 The lower ridges of Kumaon lay spread out below us, the mountain of Binsar being higher than anything in its immediate vicinity. Up north, the ridges gradually swelled up gradually until my eyes leaped up in one breathtaking sweep to a fantastic 180 degree arc of snow peaks. I can’t describe the thrill I felt. My first sight of the Great Himalayan range in exactly a decade! From the west to east ran a fabled line of peaks- Trishul, Nanda Ghunti, Sunderdhunga Col, the Maikitoli ridge and the peak of Panwali Dwar on the outer curtain ridge of the Nanda Devi sanctuary; and rising like a cathedral spire behind Panwali Dwar, the majestic twin peaks of Nanda Devi. It is the view to end all views. The peaks were slowly turning from mysterious silhouettes to jagged teeth of white and gold as the sunlight crept over them. To the east of Nanda Devi lay other great peaks- the Nanda Gond, Changuch, Rajrambha and the peaks of the Milam glacier; and then the beautiful five peaks of the Panchachuli (actually you can see only four of the five peaks). The peaks further east in Nepal were indistinct in the golden morning haze. 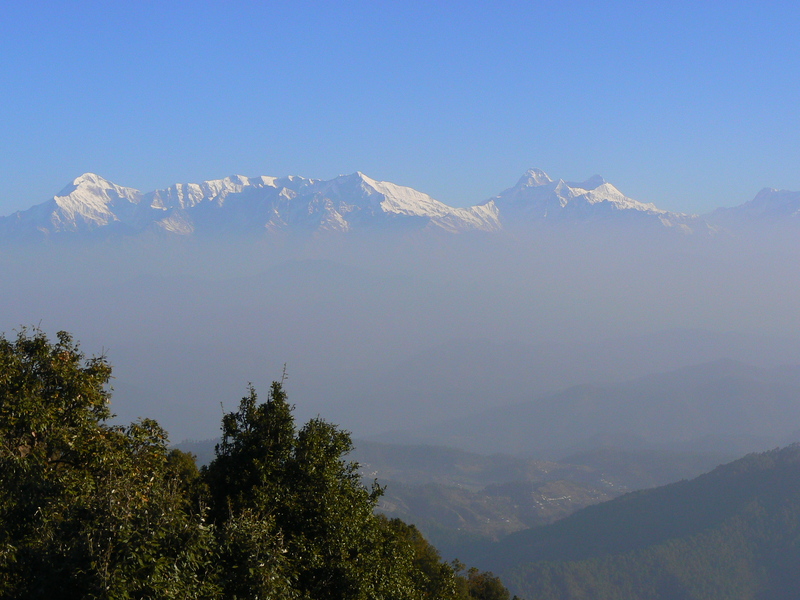 From Binsar, the Greater Himalayan range is a mere 25 km as the crow flies, the closest point being Trishul. As we watched, a sudden plume of snow started blowing from the 7,900m peak of Nanda Devi. The patron goddess of Garhwal and Kumaon must be making breakfast, as the local people believe. The immense size and scope of the range really hits you from a vantage point like this. All sleep faded from my eyes. The KMVN guest-house is wonderfully basic. The rooms have no electricity- in keeping with the forest department’s norms- and are candle-lit by night. The people have just brought us two steaming buckets of water. 9:30 AM. A quick note at the Forest Rest House. After that vision at dawn, we freshened up and went down for breakfast. Thankfully there was just us, along with a couple of other scattered people. Not many people come to Binsar at this time of the year, as the weather’s still predominantly cold, especially in the evenings. The real deluge comes in the summer months, as battalions of cars from as near as Almora and as far away as Delhi disgorge tourists here. Whatever people were there stay at the resorts outside the forest limits, where amenities such as electricity and cable tv could be enjoyed. Despite the lack of people, The KMVN guys had set out a large breakfast of toast, butter, alu paratha and coffee and tea. Priyo and I ate quickly as we were anxious to check out our reservation at the Forest Rest House. I was happy enough with KMVN, but Priyo was adamant about utilise his booking, and I agreed with him that if we had the chance for greater solitude, we should actively court it. So we set off up from the clearing where KMVN was situated and headed off into the forest. Ignoring a wide path that branched off to our right we continued down the tarred road, until it got us to the FRH a few minutes later. 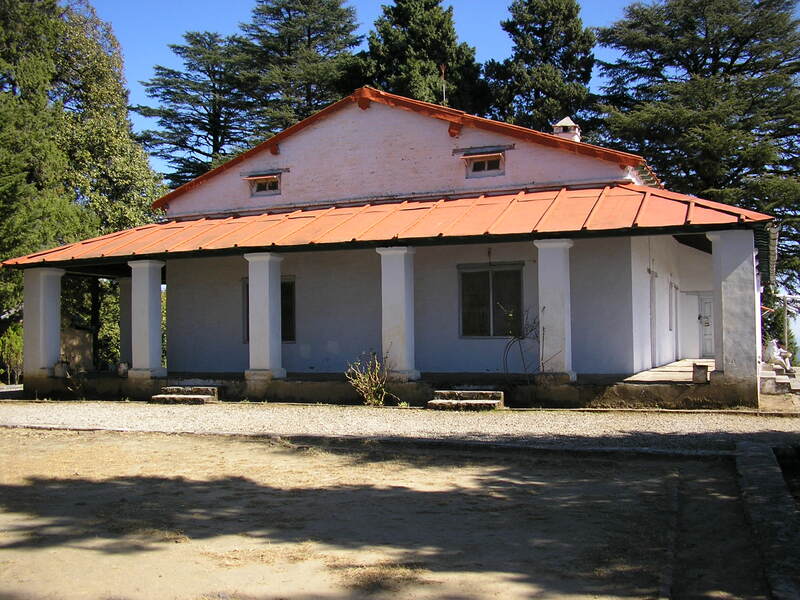 The FRH occupies a large clearing in the forests on a south east spur of the range, overlooking the road to Almora. New outhouses, and additional accomodation dot the path that leads to the old Rest House, a large, magnificent bungalow with a red sloping corrugated iron roof. Set to one side are four huge deodhars, truly gods among trees. At first we didn’t find anyone there. Then we saw a man sleeping on a grassy sward below one of the outhouses, with a towel on his face to block the sun. We called to him. A wizened old man emerged, from behind the towel. He greeted us in a lackadaisically cheerful way. 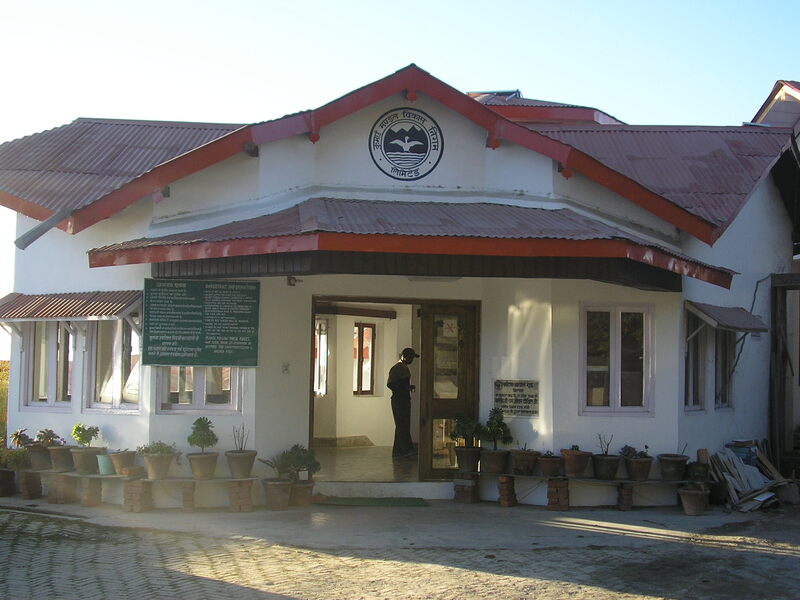 Priyo then proceeded to explain to him in atrocious hindi of the booking he had made with the Corbett National Park head-office in Ramnagar for this guest-house. The man seemed doubtful. But as Priyo explained the procedure he had undergone to book it, from the many phone calls to the faxes, the man- who was evidently the caretaker- became more interested. We introduced ourselves. The man was called Govind, a wildlife warden and caretaker of the FRH. He first tried to get us to accept one of the newer bungalows. It looked very comfortable, but we obviously wanted the old one- the real deal. Govind was a little doubtful as he was expecting a Forestry big-wig the next day, and hadn’t recieved any news of our booking from Ramnagar. I guess we looked sincere enough, and pleading, so he told us to get some lunch, and come back in the afternoon while he got one of the two rooms at the old bungalow cleaned. Then he would try and reach Ramnagar on the wireless to confirm our booking. Meanwhile, we could stay at the main bungalow till the Forestry guy arrived, whenever that was. We could always shift to the newer bungalow. 11:30 AM. Sitting on the watchtower at Zero Point in Binsar.This sadly isn’t the rickety, tall iron watchtower of old. That one finally collapsed a couple of years ago, to be replaced by this sturdy brick and mortar one. This one though doesn’t clear the canopy and the trees cut off the views to the north-west towards Garhwal. But the Kumaoni panorama is quite stunning. The clouds are rising up the face of Nanda Devi. Of the entire range actually. Dense battalions of fluffy cirrus clouds march upon the snow giants on the horizon.Looking towards Nepal…heh, just saying so seems so strange. Nepal. Well, when you’re standing on your terrace, you will see other houses, neighbours. Anyway, towards Nepal, beyond the horizon, I can make out ghosts of peaks, Dhaulagiri and the Annapurna group. Right under me lies the wide valleys and deep gorges of Kumaon, shimmering greens and browns, rivers far away glinting in the clear daylight. Its a marvellous sight, the ridges ebbing and and swelling in n unbroken chain to the north and east. The farthest ridges fade into the intense sun-haze that lies across the waist of the great range Its like looking at some distant magical land from the forest at its doorway. A wonderful light plays on everything from the dense forest around me- buzzing with bees, no, flies; large, slothful monsters- to the distant peaks. Your sight deepens as your eyes try to adjust to the depth and distance of the scene. Thanks Sandeep. Things must’ve been very different in ’84, though I’m glad that the core forest remains quite pristine. Walking down the myriad trails over fallen leaves and drinking the rhododendron juice is how Binsar makes me want to live. @picturestarts: February is a great time to go. December too would be good for the views. It’ll be pretty cold, but over the last few years winters have been getting milder. Though that’s not at all a good thing, at least you CAN go in December. You’ll have to check if the KMVN place is open though. Some nice home-stays have also come up in th villages just outside the forest perimeter. lodges and guest houses in the hills are always so quaint, pretty…with sometimes such oddly amusing but very warm people. would Dec be an ok time to go to Binsar?